You’re sitting in a reception area, dressed in a carefully chosen outfit. You’re showered and polished. Your hair is perfect. Your hands are manicured. Now, if only your palms would stop sweating! Few things are quite as unnerving as job interviews. You approach them knowing that unless you match the employer’s expectations you’re not going to land that sweet gig. Fortunately, there are plenty of things you can do to ensure you’ll make a good impression when the stakes are high. First impressions start here, so make sure you get it right. Your next career move could well begin with a hello and a handshake. In the reception area, introduce yourself. Hi, I’m Jill Jackson. I’m here for my 10:30 interview with Jane Smith. When you meet the person who’ll be interviewing you, extend a hand, say hello, and introduce yourself again. Hi, Ms. Smith. I’m Jill Jackson. Thanks for inviting me to meet with you today. Here’s a tip: Keep a folded napkin or handkerchief in your pocket. It’ll be helpful if you need to dry your hands quickly before you meet the interviewer. It’s harder to make a good impression with sweaty palms. The single best thing you can do to ace an interview is to conduct some research ahead of time. Learn as much as you can about the company you’re interviewing with. Visit their website and look for things like a careers or culture page. Scan their social media accounts to get a feel for their brand voice. Visit to see what employees are saying about them, which might give you more culture clues as well as insight into their strengths and challenges. When you’re armed with information, you’ll feel less vulnerable, and when the time comes, you’ll be able to demonstrate your insight into the company. I noticed that The ABC Corporation’s blog focuses on content for working professionals. Can you tell me more about how that plays into your branding strategy? ABC’s website has a great culture page! It gave me a real sense of what drives your team. There’s no more open-ended question than the one every job seeker loves to hate—“Tell me about yourself.” How do you project an image of confidence without arrogance? Do you mention anything personal or stick to business? It’s a good idea to prepare your answer to this question ahead of time. It’s often used as an ice-breaker, so go ahead and begin with a few bits of personal information. I moved cross-country to the west coast two years ago—I love it here! I’ve been spending time adventuring and getting to know the area cuisine. I’m a foodie at heart. Don’t dwell on the personal for more than a couple of beats. Segue into talking about your professional life. I ventured out west because marketing is my passion, and I saw so many opportunities in Silicon Valley. I’d love to tell you about some of the strengths I’d bring to this position. I enjoy networking. I attended three professional conferences last year, and not only did I get valuable insights, but I also connected with some solid new leads. Good communication is important to me, so I’m always sharpening my writing skills. I wrote my company’s top-performing blog article last quarter. Be concrete. Show how your skills have made a difference in your professional life. But also, be concise. Nattering on about your talents for too long can make you seem arrogant or self-absorbed. 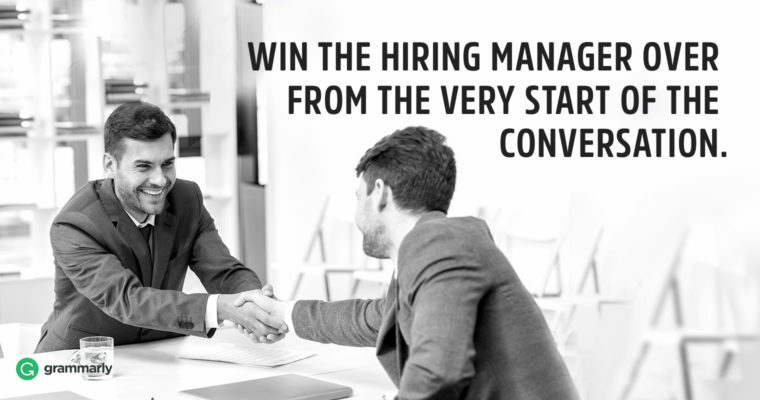 Here’s a tip: You’ll have the advantage if you know what the hiring manager is looking for in advance. If you used a keyword strategy to craft your resume, apply that to your understanding of the topics you should focus on during your interview. Interviewers may be in positions of power, but that doesn’t mean most are good at interviewing. In fact, many interviewers struggle with it. They overestimate their intuitive sense of you and make snap judgments. They may overvalue things like how articulate you are, your assertiveness, and even your technical chops without really asking the questions that will determine how fit you are for the position. If the interviewer isn’t asking the right questions and assessing you in a way that lets you show your best angles, be prepared to step in and demonstrate your strengths. Most interviewers ask questions unrelated to real job requirements. As the person being interviewed, you need to take control to ensure you’re being evaluated properly. This starts by asking the person to describe the job in terms of real objectives and challenges. Then you need to describe work you’ve done that’s most related. Preparation is the key to knocking your interview out of the park. Take time to rehearse your answers to. Stay positive, smile, and try to relax. You’ve got this!